REALLY … 2 BILLION DOLLARS!!! Steve Ballmer, the former CEO of Microsoft, has won the bidding war for the Los Angeles Clippers at a reported offer of $2 billion. That is if you can call paying $2 billion for the Clippers a win. The 58 year old Ballmer is worth a reported $20 billion, well make that $18 now if the deal is approved by the NBA commissioner Donald Sterling and three-fourths of the 30 NBA owners. 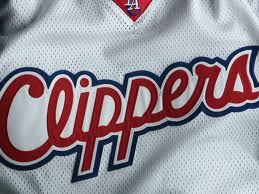 Ballmer has reaffirmed his promise o keep the team in Los Angeles and not move it to home in Seattle. The sale price is almost four times the highest previous NBA franchise sale price, the $550 million paid earlier this month for the Milwaukee Bucks. Sorry, Steve Ballmer is not the winner … the real winner is Clippers co-owner Shelly Sterling. Well folks, don’t ask for things they might just come true. The next round of complaints will be that it is unfair for banished from the NBA for making racist comments, Clippers owner Donald Sterling, make such an amazing profit on the sale of the Clippers. Sterling paid $12 million in 1981. OUCH, from $12 million to $2 billion, that is quite the investment. Look for cries of foul that Sterling made money for racist comments. But I don’t see any complaints from Obama about income inequality when it comes to Ballmer and the other richest sports owners. Steve Ballmer and Dr. Evil … Separated at birth. 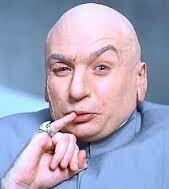 1 MILLION 2 BILLION DOLLARS!!! he Geffen group offered $1.6 billion and the Ressler-Karsh group $1.2 billion. People familiar with both those offers said they were rejected. UPDATE I: Donald Sterling ruled mentally unfit, can’t prevent Clippers sale. Los Angeles Clippers owner Donald Sterling does not have the authority to stop a $2 billion sale of his team because he has been determined to be mentally unfit to make decisions related to the family trust, a person familiar with the situation told USA TODAY Sports. The Sterling Family Trust owns the team, with Donald and his wife Shelly each owning a 50% share. The trust spells out provisions and procedures related to the mental capacity of the trustees, and Donald Sterling did not meet the standard in a determination by experts, giving his wife sole decision-making power for the trust, the person said. 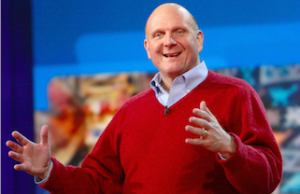 UPDATE II: NBA confirms L.A. Clippers sale to ex-Microsoft CEO Steve Ballmer. The NBA confirmed on Friday that the Los Angeles Clippers have been sold to former Microsoft (MSFT) CEO Steve Ballmer for $2 billion, the largest ever for an NBA franchise. The NBA, Shelly Sterling and the Sterling Family Trust today resolved their dispute over the ownership of the Los Angeles Clippers. Under the agreement, the Clippers will be sold to Steve Ballmer, pending approval by the NBA Board of Governors, and the NBA will withdraw its pending charge to terminate the Sterlings’ ownership of the team. Because of the binding agreement to sell the team, the NBA termination hearing that had been scheduled for June 3 in New York City has now been cancelled. Mrs. Sterling and the Trust also agreed not to sue the NBA and to indemnify the NBA against lawsuits from others, including from Donald Sterling. The statement came as NPR’s Tom Goldman received word from Sterling’s attorney that his client would sue the NBA for $1 billion in damages for terminating his ownership of the the team. The lawsuit is “based on multiple counts, including antitrust violations, invasion of constitutional rights, breach of contract, breach of fiduciary duty,” Tom says. “This is a lawsuit against the NBA and Commissioner Adam Silver, who of course banned Sterling for life, fined him $2.5 million and is in the process of trying to remove Donald Sterling from the ownership of the Clippers,” he says. D-I-V-O-R-C-E, Say it isn’t so, BSNBC, I mean MSNBC.com is no longer … The heck with Tom-Cat’s divorce, this one is a bit more important and has greater ramifications, especially in the on-line news industry. After 16 years of Internet marriage, Microsoft and NBC have finally divorced, the result is the dissolving of MSNBC.com which will become the artist formally known as BSNBC. Actually, the new on-line media outlet will become NBCNews.com and will moved its operations from the Microsoft campus in Redmond, WA to NBC News’ longtime home in New York. Microsoft will receive about $300,000,000 for its remaining shares. Microsoft is pulling out of the joint venture that owned MSNBC.com, freeing the world’s largest software maker to build its own online news service. The breakup announced late Sunday dissolves the final shreds of a 16-year marriage between Microsoft Corp. and NBC News, which is now owned by Comcast Corp. The relationship began to unwind in 2005 when Microsoft sold its stake in MSNBC’s cable TV channel to NBC. 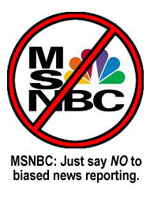 NBC is buying Microsoft’s 50 percent interest in the MSNBC website for an undisclosed amount. MSNBC.com will be rebranded as NBCNews.com, and readers who logged into MSNBC.com late Sunday were automatically redirected to NBCNews.com. Microsoft will no longer be obligated to contractual obligations with NBC and will now be able to pursue building its own online news service. As reported at the WAPO, Microsoft had grown extremely frustrated as they were required to exclusive MSNBC, liberal, moonbat content. Microsoft, in particular, had grown frustrated by contract terms requiring it to exclusively feature MSNBC.com content on its own websites. That exasperation was exacerbated by the MSNBC cable channel’s strategy to counter Fox News Channel’s appeal to conservative viewers by tailoring its programming for an audience with a liberal viewpoint. The strategy fed a perception that material from MSNBC’s website was politically slanted, too.